When you choose to go on a beach vacation, two of the most important aspects of your trip are the location of the resort and the amenities provided there. 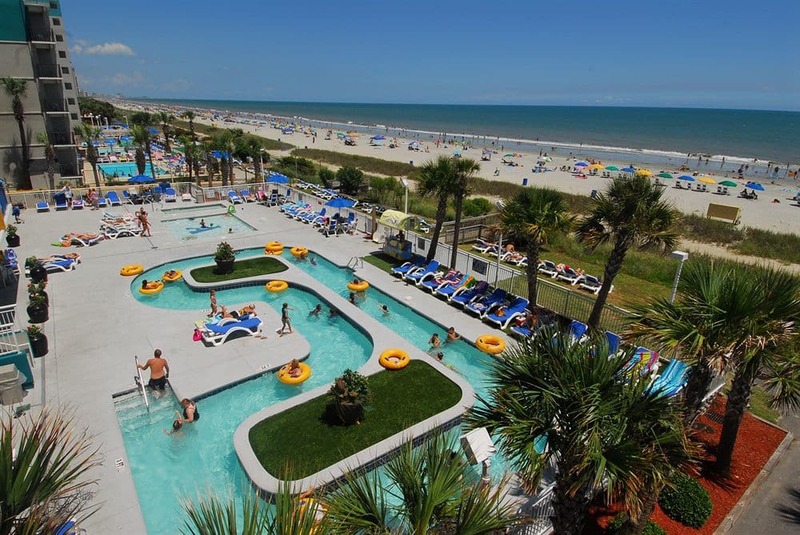 Luckily when you reserve a stay at Atlantica Resort Myrtle Beach, you will get the best of both worlds. This Myrtle Beach downtown hotel is the perfect destination for your next oceanfront adventure! Atlantica Myrtle Beach features beach front suites and condos close to the strip of Ocean Boulevard and near the Boardwalk Myrtle Beach. This family friendly hotel is situated near 501, making it easy for you to navigate as you arrive to the city. The Atlantica Towers offer up spectacular views overlooking the east coast and sparkling Atlantic Ocean, all from the comfort of your condo's private balcony. From 1 bedroom standard oceanfront condos to 2 bedroom deluxe king bed suites, Atlantica offers a variety of accommodations options to fit your preference. No matter which unit matches your vacation style, the location and accommodations you get with Atlantica Resort are sure to keep you comfortable and entertained throughout your vacation. Plan ahead to spend lots of time lounging and relaxing while you enjoy the numerous amenities offered at the resort. Outside, you'll find an oceanfront swimming pool, as well as an outdoor Jacuzzi, large Kiddie pool, and soothing lazy river. Soak up the sun while you partake in these exciting outdoor areas. For the rainy days or when the weather gets cooler, stay inside and enjoy the indoor pool, which features a lovely, cascading waterfall. There's also an indoor hot tub, perfect for relaxing after a busy day. After you've experienced all of the on-site amenities at Atlantica, you'll still have plenty to do with the Atlantic Ocean right at your doorstep! Take advantage of easy beach access and unlimited hours of beach time during your stay at Atlantica Resort. When you are ready to see the sights and sounds that Myrtle Beach has to offer, set out on foot and enjoy the short walk down Ocean Boulevard to get to attractions like the SkyWheel and Boardwalk Myrtle Beach, featuring dozens of shops and restaurants. Pick up a souvenir and a funnel cake and check out the oceanfront arcade at the Fun Plaza. Stay on top of local events and partake in a variety of festivals set at the old Pavilion grounds, including the Carolina Country Music Fest, Food Truck Festival, and much more! Located just blocks from this area, Atlantica Resort is the perfect downtown Myrtle Beach destination if you're looking to get the full Myrtle Beach experience. Other attractions like Broadway at the Beach, Coastal Grand Mall, and Ripley's Aquarium are just a short drive away from Atlantica, and you will find hundreds of popular restaurants throughout the surrounding areas. Reserve your next beach getaway at Atlantica Resort in Myrtle Beach, where you'll get to experience outstanding amenities and a superb, convenient location.